McAfee & Taft, Oklahoma’s largest law firm, received top marks in the 2016 edition of the Chambers USA Guide to America’s Leading Lawyers for Business, earning top rankings in the areas of corporate/commercial (including tax and healthcare), energy and natural resources, intellectual property, labor and employment, litigation and real estate law. The firm’s Native American law practice was also highly ranked. In addition, 41 of the firm’s attorneys were honored as leading lawyers in their respective practice areas. H. Cole Marshall was named a first-time honoree and “Associate to Watch” in the area of real estate law, and John A. Kenney was honored in two categories, litigation and intellectual property, for the seventh consecutive year. 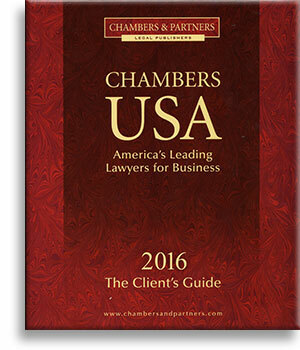 Researchers with London-based Chambers & Partners Publishing, publishers of the 2016 guide, conducted in-depth interviews of attorneys and clients throughout the United States to identify and rank the nation’s leading business lawyers. The final rankings are based on such factors as technical legal ability, professional conduct, client service, commercial awareness/ astuteness, diligence, commitment, and other qualities most valued by the client. McAfee & Taft is one of the nation’s 250 largest law firms as ranked by the National Law Journal and serves clients locally, nationally and internationally in the areas of appellate, aviation, banking and financial institutions, bankruptcy, business restructuring and workouts, business transactions and finance, employee benefits and executive compensation, energy and oil & gas, environmental, healthcare, intellectual property, labor and employment, litigation, real estate, securities, subrogation recovery services, and tax and family wealth. The firm employs nearly 350 Oklahomans, including 174 attorneys, and has offices in both Oklahoma City and Tulsa.